Hello! I apologize for the lack of updates recently but as you may or may not know, this is my 100th post and I wanted it to be my entry! Cheesy yes indeed. Entry first then you can decide to read the wall of text or not. I wanted my first entry to be a little more avant garde. I guess I call this the stiletto optical illusion. This isn't photoshopped at all I was lucky this is the one and only shot that came out this way. The shot is perfect, this is how I envisioned the photo to look! I just wish my nails were longer so the stiletto would be cooler looking. I am a quiet and shy person. I am the epitome of fufu girly: pink, bows, anything pastel, cute puppies, you name it. I don't like to wear dark eye makeup (maybe I don't know how to put it on, yeah! ), I usually wear jeans and a t-shirt. My alter ego would be bold, loud and striking! She would wear 6 inch stilettos and a mini skirt. So anyway, it struck me, I instantly knew I had to do some kind of faux stiletto nails. I have never seen a fake stiletto done on natural nails before. I was dubious but it can be done! My alter ego would definitely do an asymmetrical french, just because she can. Bronze and black is something I would never wear. It's on! Oh before I show you the transformation process, here is my right hand. I am right-handed so please excuse any oopsies! This was harder to photograph, but my first picture shows you the illusion so you get the idea. 3 coats of MAC Vestral White. This is only white I had that matched my printer paper. I totally fouled up my pinky so I took it off and went to the next nail. I painted the tips black with acrylic paint, filled in the other part with MAC Mercenary. Then by accident I brushed my tip with Mercenary and I discovered that I could brush lightly over the uneven texture of the black paint and it would leave this sort of neat design. Kind of like rubbing a pencil on paper over a coin. Embossing? I don't know lol. Here I finished one nail and pretty pleased so I did the rest. You can really see the texture of the tips and how the bronze polish went over it. Another shot of the final look. Bling bling! The trick to photographing this is to not have any shadows. I used 2 lamps and flash to avoid it haha. The end! I had a blast doing this, thank you Illamasqua for getting me to do some nail art. 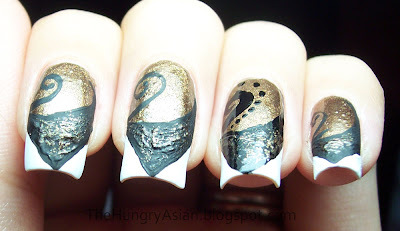 If you would like to enter your own nail art, here is the link to the contest. You have until Sept. 6th, so you can think about it! Thank you everyone for looking! Wow! Kae that is so cool. At first, I thought you had filed your nails down! I had to look really closely to see the white. I like the textured bronze on the black, that came out neat! Whoa I thought they were filed down as well! I hope you win, good luck! Your nail totally looks like they are filed to a sharp tip. Girl, you are so good! Thank you! I hoped my idea would translate onto nail, thank goodness. Ha! You think I would get rid of my square nails, you must be out of your mind! Have you seen the acrylic stilettos? how do you not stab yourself and loved ones in your sleep? oh man I got you too? score! 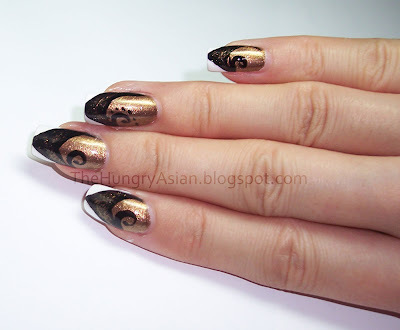 :) ooh can you imagine this on diana's nails? lol she would rock it! Congrats on your 100th post sweetie! What a post! I thought, oh no her beautiful nails. Why ruin them for a contest. It's all a sneaky optical illusion. I give you first prize. I would if I could. I love the design you sneaky thing you! 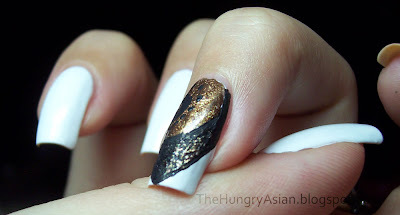 Love the combination of black and gold. Just a beautiful design. So very clever! You got me too for a minute! I love the look you created. I may give this a try in the winter when there are no flower rings to be had. In the meantime, I will search for printer paper white and keep practicing my photography. Expect an e-mail from me requesting help sometime after all the leaves have fallen. Oh, congrats on your 100th post! Nice :) I also thought that you filed your nails, but this is really great. What a neat idea! I also thought they were filed, Good luck! Hope you win! That is amazing - well done you. I too thought you'd gone all pointy! Good luck! I haven't got anywhere near thinking about my entry yet. This is stunning Kae!! Rachel loves it really much! I thought like everyone that you file your nails, scared me.. haha.. I WIsh u good luck girl... ur nails are awesome!! Very interesting and awesome. I thought at first that your nails came to a point. I couldn't tell that that was white nail polish on the sides. Very cool! Aww thanks, muwhaha I got you too! You are such a sweetie pie! Thank you! Your nails would make crazy long stilettos. Thank you! Haha, I am on a roll, fooling everyone. I can't wait to see your entry! Thank you! I am so happy. Haha! I think my c curve is too much, my tips ight now are so curled it's driving me crazy! I want to cut them short, but I might do another entry so I have to wait =x You have the longest nail beds I love your nails! Thanks! I was worried right up to the point where I was looking at my photos on my computer about the whole illusion effect haha. I'm so relieved it worked! This is gorgeous, Kae! You are very talented! Did this take you a long time to do? I will keep my fingers crossed for you for the contest!!! Amazing Kae!!! That design is awesome...congrats on your 100th post! wow! I thought you had filed your nails down as well. great optical illusion!! Wow!! These are wonderful, creative, and well done!! Good luck to you - these are def. winners! Thank you :) I think I spent a couple of hours the day before carefully applying the white polish, waiting 20 mins between each coat. Then the next day I actually did the art. Took about 40 mins to do my left hand, and 20 on my right since I got the hang of it by then. Haha, I just checked tracking before I came here! I am excited. Do you use their primer too? I use smashbox photofinish primer.